Maria Antonia Pasquarelli first appears in the Painesville, Ohio, area in the 1920’s. 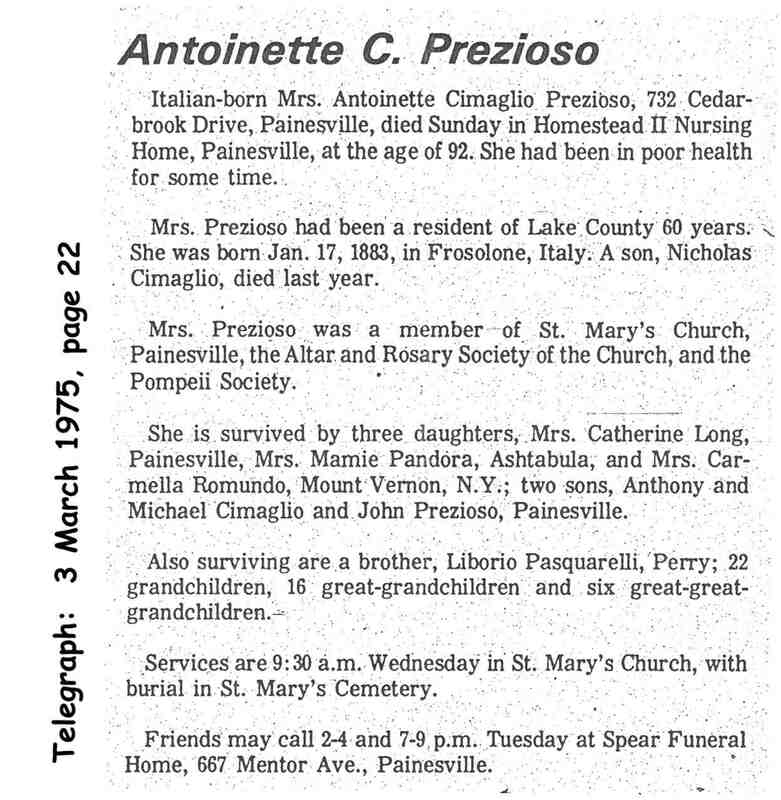 In America, Maria Antonia Pasquarelli was known as Antoinette Cimalgio, then after re-marrying, Antoinette Prezioso. Maria Antonia Pasquarelli, daughter of Giovanni Pasquarelli and Angela Mezzanotte, was born on January 18, 1885, at Frosolone, Italy. She married first, Giuseppe Russo, son of Giovanni Russo and Vittoria D’Angelo, on October 22, 1908, at Frosolone, Italy. Giuseppe Russo passed away in Italy. Maria Antonia Pasquarelli married second, Angelo Cimaglio, son of Paolo Cimaglio. 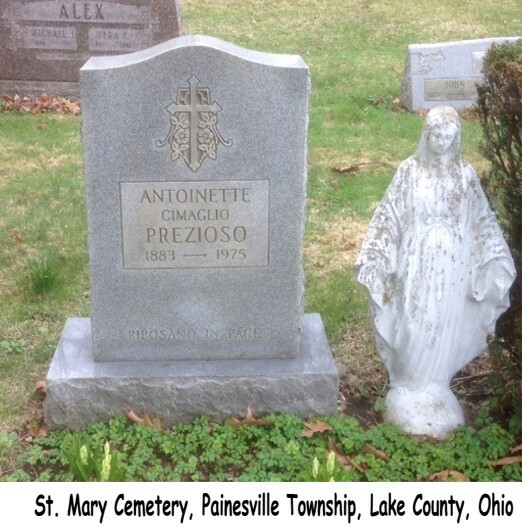 After Angelo Cimaglio’s death, she married third, Felice Preziuso, son of Giovanni Preziuso and Caterina Mainella, on October 19, 1940 at St. Mary Catholic Church, Painesville, Lake County, Ohio. Antoinette died on March 2, 1975, at Homestead II Nursing Home, Painesville, Lake County, Ohio, at age 92. Her body was interred at St. Mary Cemetery at Painesville Township, Lake County, Ohio. When Maria Antonia Pasquarelli’s second husband died in 1930, she was left to raise three sons (ages 17, 15, and 8). Antoinette’s brother, Liborio Pasquarelli, migrated to Painesville, Ohio, about 1915. Her father, Giovanni Pasquarelli, was living in Painesville in 1922. 1. Nicola Cimaglio was born on December 5, 1912, at Casalciprano, Italy. He married Delphine P. Borrelli, daughter of Crescenzo Borrelli and Lucia Lombardi. Nicola died on July 17, 1974, at his half-sister Carmella’s home, while visiting, Mt. Vernon, Westchester County, New York, at age 61. His body was interred at Perry Cemetery at Perry Township, Lake County, Ohio. 3. Anthony D. Cimaglio was born on January 12, 1922, at Providence, Providence County, Rhode Island. Anthony died on April 17, 2010, at Homestead II Nusring Home, Painesville, Lake County, Ohio, at age 88. His body was interred at Riverside Cemetery at Painesville, Lake County, Ohio.